Lucknow has been experiencing mounting pressure on its transport infrastructure and has witnessed tremendous growth in the last two decades. As per census of India 2011, the population of Lucknow Urban Agglomeration is 29 lakhs. The population of Lucknow Metropolitan Area is over 50 lakhs. The state capital has 14.24 lakh vehicles, 80 per cent of them being two wheelers and 14 per cent cars. The city is witnessing an annual growth of 8.35 percent in vehicular population. The construction of the much-awaited Lucknow Metro commenced Saturday with a bhoomi pujan in the presence of Chief Minister Akhilesh Yadav and senior ministers of the state government. 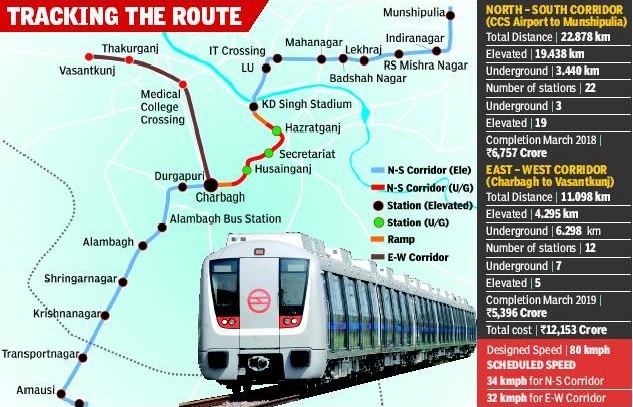 The first phase of construction, for which work began Saturday, will cover about 8 km between the “priority section” of Transport Nagar and Charbagh, and is expected to cost about Rs 2,000 crore. While Larsen and Toubro has been selected for civil works, Systra, a French company, has been selected for designing metro stations and via-ducts. This priority line will have eight stations. The priority section is a part of the 22.87-km North-South Corridor between Amausi Airport and Munshipulia, which is expected to cost Rs 6,880 crore. “I have full confidence in Metroman E Sreedharan (principal advisor for Lucknow Metro) and all the related departments that the metro will start running before the next Assembly elections,” the CM said after the bhoomi pujan. Earlier on March 3 this year, the foundation stone had been laid for metro’s North-South Corridor depot from the same venue, the 32nd battalion, PAC Campus. “No state government in the country is working for metro in three districts. After NOIDA and Ghaziabad, work has now started in Lucknow,” said the Chief Minister who was accompanied by ministers Azam Khan, Ahmad Hasan, Rajendra Chaudhary, Ram Govind Chaudhary, Abhishek Mishra and other top government officials including Chief Secretary Alok Ranjan. On the occasion, the CM also took on his critics, saying the Samajwadi Party government did not just stick to its manifesto but took several other steps, such as the metro, as per the needs of the people. “A journalist asked me about my hobby these days. I told him that my only hobby these days is how to remain happy,” he said. With Uttar Pradesh Chief Minister Akhilesh Yadav putting major projects on the fast track, development is likely to be the cornerstone for the Samajwadi Party’s bid for reelection in the 2017 Assembly polls. Yadav aims to have some of these projects — including Lucknow Metro rail, Agra-Lucknow Expressway, IT City and linking district headquarters with four-lane roads — at least partly operational so that his party can show tangible results to the electorate, and prevent a rerun of the drubbing they got in the Lok Sabha polls earlier this year. Schemes such as free laptop, unemployment dole, Kanya Vidya Dhan — the pre-poll promises of which were credited with providing the boost to the party in the 2012 Assembly election — are likely to be on the back burner for now, as they failed to provide any gains to the Samajwadi Party in the 2014 elections. Yadav has been quick to make ammends. The foundation of Lucknow Metro rail and IT City project have been laid. The work on acquiring land for the Agra-Lucknow Expressway has been started. Private companies have been given the contract to construct the expressway in five different parcels. The foundation of IT City was laid on Wednesday by Yadav in the presence of HCL Technologies promoter Shiv Nadar. HCL Group company Vama Sundari Investments is developing the IT hub spread over 100 acres at Chak Ganjariya Farm along the Lucknow-Sultanpur Highway. On the occasion, Yadav also laid the foundation for an Indian Institute of Information Technology and a state-of-art Medanta Awadh hospital. The IT City project would have a total investment of Rs 1,500 crore and provide direct employment of 25,000 people, along with indirect employment to around 50,000. It would have a skill development centre spanning over 10 acres, from which 5,000 students would graduate every year. HCL Founder Shiv Nadar said the proposed IT City would be a “stellar model” for India, providing both training and employment opportunities at one place. E Sreedharan is an advisor to Kochi Metro, Jaipur Metro and other metro rail projects in Andhra Pradesh.After having successfully executed the Delhi Metro project, ‘Metro man’ E Sreedharan will now supervise over the evolution of the Metro network in Lucknow. Sources said nearly two dozen officers and engineers from Delhi Metro are set to join the Lucknow Metro project for which Sreedharan is an advisor. Kumar Keshav, who quit Delhi Metro in April 2012 as Director (Projects & Planning), has been appointed the new managing director of Lucknow Metro Rail Corporation. Keshav, a trusted lieutenant of Sreedharan, was instrumental in development of Delhi Metro’s phase-II and phase-III projects. Sreedharan is also an advisor to Kochi Metro, Jaipur Metro and other metro rail projects in Andhra Pradesh. Similarly, two senior officials of Delhi Metro – Mahendra Kumar and Daljeet Singh are set to join the new organisation in the capacities of director (electricals) and director (project), respectively. Well-placed sources said at least 20 other engineers of Delhi Metro are also in the queue to take up new jobs in the Lucknow Metro. Sources in Delhi Metro said attrition has been a cause of worry for the top management. They said the exit of several senior officers and experienced engineers has created a vacuum. उत्तर प्रदेश के मुख्यमंत्री अखिलेश यादव कहा है कि उनकी सरकार की कोशिश होगी कि 2016 के अंत तक लखनऊ मेट्रो चलने लगे. मेट्रो रेल परियोजना के भूमि पूजन के मौके पर उन्होंने ये बातें कहीं. अखिलेश ने याद दिलाया कि लखनऊ मेट्रो परियोजना की शुरुआत के मौके पर नेताजी (मुलायम सिंह यादव) ने कहा था कि यह परियोजना अगले विधानसभा चुनाव तक पूरी हो जानी चाहिए. साथ ही यूपी सीएम ने भरोसा दिलाया कि आगरा-लखनऊ एक्सप्रेस-वे का काम आगे बढ़ रहा है. अखिलेश यादव ने दावा किया है कि प्रदेश की समाजवादी पार्टी सरकार ने राज्य के विकास के लिए ऐसी बहुत-सी परियोजनाओं पर काम किया है, जिनके बारे में अन्य राज्यों के पास कोई नजरिया तक नहीं है. LUCKNOW: The Uttar Pradesh government has decided to run metro rail in Meerut, Kanpur, Allahabad and Varanasi, after pushing for a similar project in Lucknow, an official said on Tuesday. Chief secretary Alok Ranjan has asked officials to prepare a detailed project report for the same. The development came after officials on Monday met the chief secretary and discussed the possibility of running metro rail in these cities. A techno-feasibility of running metro in these cities has already been done and now efforts are on to take it further, the official told IANS. 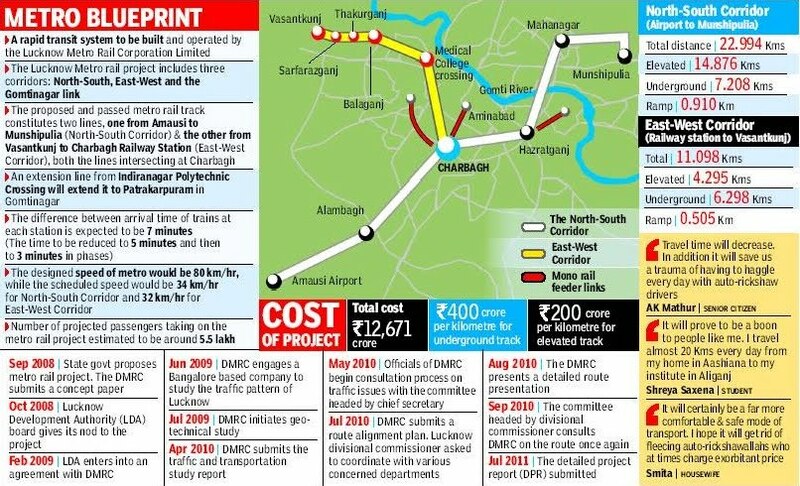 While the temple city of Varanasi, represented in the Lok Sabha by Prime Minister Narendra Modi is high on priority, the state government is keen to push for the metro rail project in Ghaziabad, neighbouring the union capital New Delhi. The state government has set a timeline of June 2016 for the beginning of the Delhi-Dilshad Garden-Ghaziabad route of metro rail. Noida in Uttar Pradesh is already connected to New Delhi with the metro. The government is also mulling the possibility of extending the facility to Greater Noida which houses a large number of industries and schools other than residential areas. The company has bagged a Rs 631 crore order from the Lucknow Metro Rail Corporation for the construction of the Lucknow Metro. Larsen and Toubro (L&T) has moved higher by 2% to Rs 1,490 after the company said it has won new orders worth Rs 1,423 crore across various business segments in September 2014, including order from Lucknow Metro Rail Corporation. The company’s heavy civil infrastructure business has bagged a Rs 631 crore prestigious order from the Lucknow Metro Rail Corporation Limited for the construction of the Lucknow Metro, L&T said in a statement. L&T’s scope includes construction of the priority section (Package LKCC 01) in the North South Corridor – 8.5km elevated viaducts and 8 elevated stations. The project was won against stiff competition and is scheduled to be completed in 24 months. The company’s power transmission & distribution business has bagged three major orders including additional orders from on-going jobs worth Rs 792 crore. A turnkey order has been received from the Power Grid Corporation of India Limited for the supply, erection, testing and commissioning of a 765 kV S/C transmission line between Lalitpur to Agra (Part – III) in Uttar Pradesh. The contract is for the supply of 765kV EHV towers, insulator hardware materials and other transmission accessories. The order will be completed in 20 months, it added. The stock opened at Rs 1,460 and touched a high of Rs 1,498 on NSE. A combined around 800,000 shares changed hands on the counter till noon deals on NSE and BSE.